In a season full of disappointment and forgettable encounters at the County Ground, the Town faithful was served up some entertainment as Richie Wellens’ side earned a point against Lincoln City. Despite hosting the league leaders Town dominated the first half and didn’t look intimidated by the challenge in front of them with new signing Canice Carroll enjoying an impressive home debut when playing in his natural position. But in true Swindon style, as the away side are reduced to ten men they open the scoring from a nothing set piece as Jason Shackell’s deflected shot squirmed past Lawrence Vigouroux followed by a defensive mix-up allowing the away side to double their lead with a superb strike. Ever since Lawrence Vigouroux joined the club in 2015 it’s been clear he’s a talented goalkeeper, in the club’s relegation from League One he rightly won all the player of the season awards the club & media had to offer, but alongside his superb performances between the sticks in his first couple of seasons, he’s never reached the same standard over the following two seasons. Last season was a nightmare for the Chilean keeper as he clashed with former manager David Flitcroft and was wrongly sent on loan to Waterford in the League of Ireland Premier Division. But this season his form hasn’t been at the same level of his first two seasons at the club, with his nightmare 10-minute spell on Saturday being his worst performance in a Town shirt. I’m not saying he isn’t a good player as he’s earned points single handily over his three and a half years in a Town shirt, but I would be very surprised to see him sign a new contract and keep him past this summer, as I can see him wanting a fresh start next season. Once again this season the responsibility of saving the day was left to Michael Doughty whose confident penalty early in the second half and calm finish in the 88th minute saw Town earn something against the nine-men of Lincoln. Doughty’s post-match comments about Town underachieving this season were refreshing to hear, as with this campaign being such a mess it’s easy to forget we shouldn’t be sitting in mid-table with the resources available to the management, thankfully Wellens has started work in this transfer window alongside his Director of Football Paul Jewell. As we saw Ali Koiki joining the club on loan from Burnley last week on a loan deal until the end of the season. The 19-year-old made his debut last Saturday and looked impressive in his short time on the pitch. With Matty Taylor’s career possibly entering it’s final five months and his performances not to the same standard of last season this will turn out to be an important loan deal going forward. 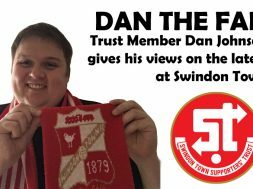 next DAN THE FAN: Renewed hope or a false dawn?